With heat waves and drought hitting various parts of America, water has become a more scarce resource than ever before. While there are definitely region-specific issues that only your local plumber can provide concrete details about, the plumbing problems you might find in Graham are quite different than those found in Thurston, but that doesn’t mean you have to be wasteful. With these easy ways to conserve water around the house, you’ll find your water consumption will decrease, and the planet will definitely thank you for that (your wallet will too!). 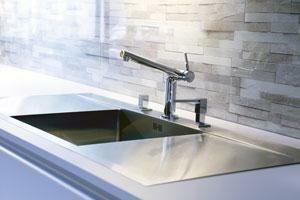 On average, the water use of a faucet at home is around 2.5 gallons per minute. With multiple people in a house, each washing their hands, brushing their teeth, etc., that number just keeps on racking up higher and higher, bit by bit. The best way to stop that is very the simplest one, just turn that tap off! There are various ways to do this. We’ll just go over a couple. First off, whenever you’re brushing your teeth, turn off the tap while rinsing. In those moments you should be focusing on your dental hygiene, and if you need the water you can just easily turn the tap back on with your free hand. Whenever you’re using a razor to shave, fill up the sink with some warm water and then turn the tap off. Rinsing with this is just as effective as using running water. The same thing happens whenever you’re washing your hands, while scrubbing, turning off the tap can easily help you save gallons upon gallons of water over time. Lastly (and not technically turning off the tap), turn off the shower after soaping up. This will allow you to thoroughly clean, and then you can just turn the water back on and rinse yourself. Given that a short shower can consume 20-40 gallons of water, this is a quick and very efficient saver. If you want, you can go an extra step and get an automatic shower timer installed. They can be tricky to install, so be sure to give your local Graham plumber a call if you need assistance. Reuse—a word you’ll get tired of hearing because it really is that important to reuse whatever water you have. It is common to have leftover water that isn’t harmful or dirty at all, yet we still throw it away instead of storing it for more efficient use. You don’t need to go ahead and reuse every single drop that’s used in your house, but having a little pot to save that water that might otherwise go to waste is a great idea. For example, whenever you’re cooking pasta, don’t throw the water away. The leftover pasta water is rich in starch and salt, by adding this to any sauce that’s too thick, you’ll make it smoother and it will go even better along with your meal. While waiting for your shower to heat up, putting a bucket under the faucet will give you some water you can later use for watering your plants. In general, leftover water from dishwashing and other activities can be used to water plants, helping you reuse all of the water used at home. You’d be surprised how easy it is to save water whenever you’re talking about cleaning things. Too often people leave a hose spraying or waste too much water for something that can be easily done with a fraction of what’s typical. One way to reduce water consumption is whenever you’re washing the dishes, fill the sink up and scrub the plates with that water, this way you can avoid using running water and you´ll make it easier to clean. Even better would be to use a dishwasher. The EPA has estimated that an efficient dishwasher uses around half as much water as hand washing, saving around 5000 gallons each year. While cleaning your car, use a bucket with soapy water instead of a hose. As a general rule of thumb, always try leave the hose only for rinsing. Another tip is to wash your pet outdoors, helping to water your plants and clean your furry friend at the same time. Just make sure to check if the soap you’re using is safe for the environment. Old things tend to break down and newer models of water-intensive appliances can be better than models considered acceptable a couple of years ago. Thanks to new regulations and the surge of a more eco-friendly market, new technologies that help saving water are popping up. In addition to Washington specific laws, you’ll find that a new model might be just what you need. For example, low and dual flush toilet models can bring up to 70% water savings. High-efficiency washing machines, water-saving showerheads, aerators, etc., all of these are some options that your a plumber in Graham can install to bring you the water-savings that you need. But in case getting something new is out of the question, the least you can do is to maintain the old. Check your house for any water leaks from faucets, pipes, or toilets. More often than not, these leaks are hidden, so in order to avoid leaving leak detection to chance, don’t hesitate to contact us. Our experienced Graham plumbers are skilled in quickly inspecting the plumbing in your house and finding both present issues and those that might strike soon.